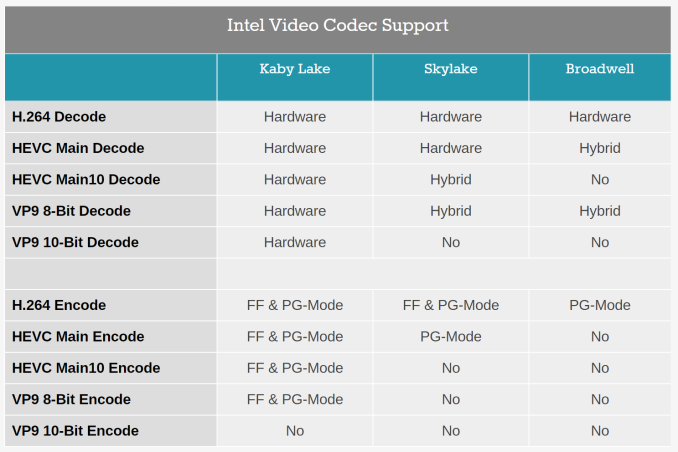 Kaby Lake processors come with Intel HD graphics chips that allows for you to do hardware decoding of VP9 and H.265 10 bit videos. Check the chart below for more details. Intel Allows you to access their Intel GPU by using the VA-API, the Arch Linux wiki has a good deal of information on VA-API and VDPAU here. To actually test if VA-API works, we have to install another AUR package to get the vainfo binary. Now you should be able to run vainfo to get the supported profiles. You should get an output like this. VLD means we have hardware accelerated media decoding. In the end I was only able to get mpv work with hardware video acceleration with VA-API. So MPV out of the box doesn’t actually use VA-API cause the developers don’t seem to like it. This driver is for compatibility with crappy systems. Unfortunately we are left to work with it. There seem to be two modes/APIs in VA-API, one EGL and the other is GLX mode. The GLX mode doesn’t render at full color and it’s the only that seems to work right now. The EGL API doesn’t work. You can also add in the line below for higher quality, though be warned that 4k videos start stuttering. CPU usage went down from about 120% with full CPU rendering of a 4k youtube video, to about 20% after it started using the GPU.